John Dillinger (June 22, 1903–July 22, 1934), one of the most notorious criminals in American History, was often glorified by the American media for his daring bank heists and thrilling prison escapes. He operated in the 20’s and 30’s during the Great Depression Era and was idolized by many as the modern day Robin Hood because he stole from those same institutions that were capitalizing on the American people’s misfortunes. Dillinger’s “career” as a criminal included over 11 bank robberies throughout the Midwest, in which he stole in excess of $300,000, and three separate jail breaks. The mystique surrounding Dillinger’s exploits was so captivating that people often forgot (or turned a blind eye to the fact) that he was responsible for at least 10 murders including that of a Sheriff, the deaths of several innocent bystanders, and that he left a trail of carnage in his wake. 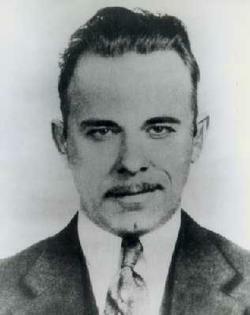 Dillinger’s activities, however, did not go unnoticed by Chief Investigator Melvin Purvis of the F.B.I., who was assigned the task of bringing Dillinger and his gang to justice. When J. Edgar Hoover and the F.B.I. named Dillinger the first Public Enemy Number One on his 31st birthday in 1934, his fame took on a new meaning, and his name and face became recognizable in every household throughout the Midwest and the rest of the country. There was even a $10,000 reward for his capture! Now a public figure, Dillinger turned to plastic surgery to alter his identity and evade Purvis and the rest of the law enforcement community. In those days, plastic surgery was not as common as it is today, and the medical procedures were primitive, dangerous, time-consuming and very painful. Dillinger underwent several bouts of plastic surgery, some more successful than others, but in the end he only managed to slightly alter his appearance. After one round of plastic surgery from which he was extremely disappointed to find that he still looked the same, one of the doctors suggested that he remove his fingerprints as a way to escape being detected. Dillinger liked this idea and elected to undergo the painful process of obliterating his fingerprints. Dillinger was not the first criminal to come up with that idea. In 1933, “Handsome Jack” Klutas had attempted to file down the small ridges on his fingers, but he ultimately failed. Two of Kate “Ma” Barker’s clan, Alvin “Creepy” Karpis and Ma’s son Freddy, decided to remove their fingerprints as well, so they hired mob physician Joseph P. Moran to do the job. Moran was inexperienced in this procedure and repeatedly hacked and knifed at their prints until the gangsters couldn’t bear any more pain, but when their fingers finally healed, the fingerprint ridges grew back to their original patterns. Hoover was aware of this trend among criminals and he became wary of the possibility of success. He commissioned several surgeons and dermatologists to report on the likelihood of someone obliterating their fingerprints, and in 1934 they came back with their findings. Dr. Howard L. Updegraff, a member of that committee, had extensive experience in the area of fingerprint alterations and he reported that the only way to permanently obliterate a fingerprint is to graft skin from another part of the body over them. And in 1941, that’s exactly what Robert Phillips did when he got a doctor to graft the skin from his chest on to the tips of his fingers. Phillips, however, was caught because the ridges surrounding the graft areas, as well as on the other joints of his fingers were used to identify him. Dillinger seemed to have taken the road less traveled when he chose acid to burn the tips of his fingers with in late May, 1934. The procedure appeared to be successful; however, faint ridge markings were still visible on his fingertips after the full healing process, as were seen after Dillinger’s death. Many people in American history have attempted to elude the authorities by scarring or ruining their fingerprints, but forensics has been able to keep up with those criminals all the while. In fact, as Phillips found out firsthand, just ruining the tips of one’s fingers does not preclude fingerprint identification. The ridges that are found on the tips of one’s fingers are also found on the entire surface of the palm, and they are just as unique to an individual. Furthermore, by introducing scars onto one’s fingers, it makes the identification process even easier, since the scar patterns are unique and less common to the general population. If one thing can be learned from Dillinger and the other notorious outlaws of the Gangster Era it’s that crime does not pay, and eventually criminals will be brought to justice, and not always the pretty way.